Description This is a rare, experimental combination of body armor (shield) and a weapon (matchlock gun). 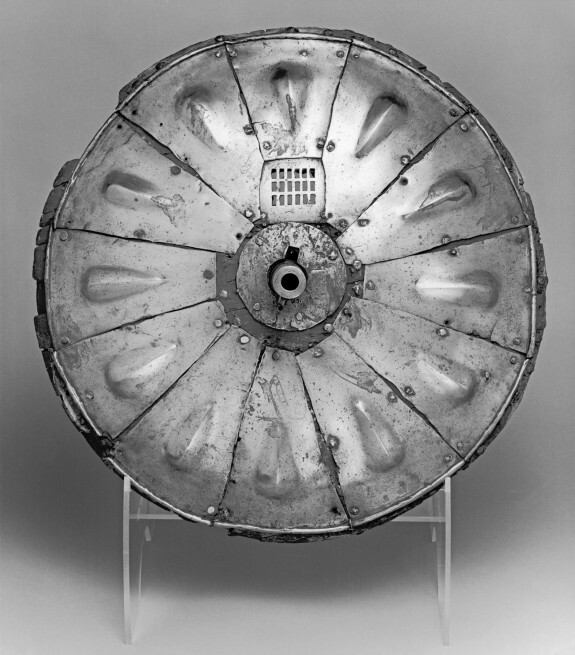 The gunsmith Giovanni Battista of Ravenna proposed this gun shield to King Henry VIII of England in 1544. Interested in technology, the king had 100 made for his bodyguards. As a firearm, it was too heavy to aim unless rested on a support and was rejected for use. However, in the late 1600s, 66 were still kept in the royal armory, perhaps as curiosities. Technological hybrids were appreciated as attempts to do two things at once. Lock mechanisms for firing guns were made by smiths who made locks for doors or chests. A door lock by Henry VIII's master locksmith is in the Collector's Study. The shield is made of two layers of wood slats positioned at right angles to one another. Both sides of the wood core are covered with a coated plain weave textile, possibly hemp(?). The front is then covered with 12 triangular wedges of iron/steel plate. Each has a teardrop-shaped lobe in the center. The gun barrel is fitted through the center of the shield. A flat plate holds it in place but a center boss is missing from the front. The rear is covered overall with yellow twill weave wool. A semicircular red wool arm pad is applied over the yellow on the lower rear. Unwoven fiber padding is present under the arm pad. The textile edges are all held by linen tape secured with dome headed tacks. The perimeter of the shield, each plate, and the missing boss were edged with a now missing fringe or trim. Thick accumulations of fiber are present under the nail heads. Remains of three leather straps are located around the rear perimeter. Two align with holding the shield with the left arm (left strap lower and longer, right strap higher and shorter). The third is at center top. The strap ends appear to be originally held a single large T-shaped nail. Some have been lost and replaced. A grill for sighting is present above the gun. The pan is attached by a curved support secured to the lower edge of the shield. The support is large enough for the left arm to pass through. The pistol is breech loading. A serpentine would lower the light match into a hole in the top of the pan. Provenance Armory at the Tower of London; John Beardmore [date and mode of acquisition unknown]; Beardmore Sale, London, 1921, lot 17; Walters Art Museum, 1981, by gift [purchased through a fund donated by Joseph Kindig, Jr.'s three children].